With the start of the Sixo Vaporis galaxy, we have added 8 new skins. All these skins are linked to special codes that you can activate in your account management area. The Skin code hunt is open! These two skins are a tribute to Ultima Online and two of its creators: Richard Garriott and Starr Long. They refer to the two characters they incarnated: Lord British and Lord Blackthorn. So if you meet one of these ships, maybe you have the chance to meet a legend (Richard Garriott is also an astronaut)! Drifting Lands is a SHMUP Hack’n Slash graphically superb and with very interesting game mechanics (the auto-warp is inspired by one of their system). And to make this skin, Alkemi Games has agreed to share with us the sources of the Marauder with which we made an original “module”! monsieursapin is a very nice french Streamer who loves to discover games in all styles to his joyful community. It was very fun to make this skin “sapin” which was also the name of the first enemies that we had in the first prototype of Gangs of Space! Bestio is THE streamer of Shmup in France. Big fan of bullets and Hack’n Slash, he fell very early on Gangs of Space and followed us all these years. This skin is like a big thank you to him for his passion of games! Indiemag.fr is a french website devoted to independent games. He has always followed the evolution of Gangs of Space. Seldell, one of the creators of the site, is a fervent defender of independent games for years. GameSideStory is the indie press of the video games. For years they have been talking about it with passion and without pressure. This crazy team has already tested over 2013 games, so that they all have a chance to exist. And that, it deserves a special skin! How to get this skin: You need to work on GSS editing, ask Skywilly! The Binding of Isaac by Edmund McMillen is one of our cult games that has greatly influenced the latest version of Gangs of Space. But all the work of McMillen is incredible and we wanted to pay tribute to him with this very weird skin. Gangs of Space has been designed from the beginning to be a permadeath game (even before we introduced the “roguelite” elements like subsystems; our inspiration is taken mostly from old arcade games). Even though we - and many players - like it this way, it is true that losing a ship can be a demoralizing experience for a new player. So today, we’re introducing a permadeath protection designed to help beginners without changing the fundamental high-level game for experienced players. it prevents you from warping to T5 or T6 systems. You can remove this item at any time (and we encourage experienced players to do so! ), but it will be destroyed in the process. To add some visual variety, all ships are now created randomly with one out of 3 base colors. Of course you can still customize your ship at any time (for free) in the Skin Shop. Alex, the composer of the soundtrack of Gangs of Space, has been touched by all your positive feedback about his compositions. So he has graced us with 10 more tracks, which triples the amount of music we now have in the game! As usual, all the details of the patch are available in the changelog. Items, ships, subsystems, drops, enemies… all there, ready for your eyes! There is still a lot of translation work though, so if you speak another language like Spanish, Russian, Chinese, German, Portuguese… then join the Wiki team on Discord! You will be more than welcome! The Empire has started the construction of a new Motherbase in Cinquo Vaporis Galaxy. Enemy forces have been evaluted to about 17,000,000. Get ready for the cleaning, and maybe the Empire will reward the most valorous of you! The Imperial Bank has computed dividends for the conquest of Quatro Vaporis Galaxy. 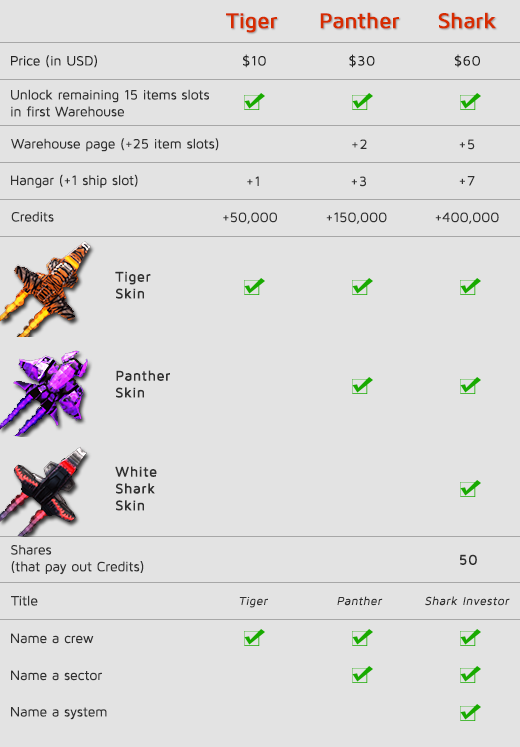 Each Share will be awarded dividends of 168 Credits, for a total of 8,400 Credits for the 50 Shares of the Shark Investor Pack. Congratulations to all players that exterminated the Pirnat faction in 1 week, 12 hours, 18 minutes, and 7 seconds. Galaxy Tertio Vaporis has been conquered in 10 jours, 11 hours, 1 minute et 6 seconds! DJOKKATAJA wins the TOP GRIND with a very impressive score of 1,174,894 SP. A new record! But Zed is just behind… on purpose, maybe? Because on the TOP SKILL side, Zed improves his previous best score, and reaches almost 33K SP/h! Jhirin and kragnir beat their previous records too, but it wasn’t enough this time. On the TOP GANG, 8-bit Warriors get their first victory, pushed by their leader and their very active members. They almost reach the previous record set by Meta in the previous Galaxy! During this Conquest, we have banned 15 accounts for cheating. We remind everyone that modifying the game client or the game memory is forbidden by our Terms of Service. It is a question of common sense: let’s keep a pleasant environment for everyone to play and compete in! The wiki.gangsofspace.com grows bigger and bigger, with new info coming every day, and translations in French and Russian starting to pop in. If you can write decent Chinese, Polish, Spanish, Portuguese, German, Japanese, or any other language spoken by a part of the Gangs of Space community, why not contribute to the effort? On the Steam side, we celebrate today our 1 month release anniversary! With 10 versions published during this period, almost one every 3 days! On your side, you’ve left 216 evaluations, 78% positive. Thanks a lot! We are pushing a lot of small updates these days, of course to fix problems that have been reported to you, but also to improve the way we convey information in the game. We’re very happy to see that the community has stepped in to help newbies understand the game better, but we need to do our part, and make the game more easily understood! We have also worked a ton on “invisible” tasks in the background, including server optimization. If you haven’t tried v0.31.8, you’ll be surprised by how much pleasant the game is to play without all these pesky server lags that plagued us since the release! Today, along with the new Conquest we are releasing v0.31.9 that revamps the ingame ladder interface, and a lot of quality-of-life improvements. Check out all the details in the changelog! How many dividends will our Shark Investors earn for the conquest of Tertio Vaporis? The latest data from the Imperial Bank shows that each Share will receive a dividend of 312 Credits, which means 15,600 Credits for the 50 Shares of the Pack Shark Investor. Thanks to kragnir for remembering to take a end-of-galaxy souvenir picture, since we couldn’t be there on time to take one. Bye bye Tertio Vaporis! Unscrew your guns, unplug your shields, clean your warehouses... the Alpha 0.30 session is over. We are very happy with the results of this session. A lot of you came to play, and seemed to enjoy the game quite a lot judging by the insane play times! The competition for the ladders was fierce, and the game was much more pleasant to play than previous versions, in great part because there were always other people to play with. Finally, it felt like a real online game for more than a few hours! We are definitely on track for the Steam release next version, and I think Grouroux and I will be able to sleep a bit better until then! Pirnats killed: let me read that right... 1,900,926... well.. that's a lot! Your opinion matters a lot! More than ever, your feedback is important to us, especially fom new players (or those who didn't play for a long time). How smooth was levelling your first ship to level 10? Did you have trouble figuring out some game mechanics? what would you have liked better explaied to you? What did you like and hate most? Did you feel discouraged at some point? did it make you stop playing? You can answer in the forum, on Discord or even by e-mail if you are shy. We're reading everything, even if we don't have time to give detailled answers to everyone! Promised! Alpha 0.30 - The Empire has prevailed! Congratulations to all players and Gangs: you exterminated the Pirnat faction of Galaxy Alpha-30 in exactly 4 days, 22 hours, 59 minutes and 32 seconds! Tigibon, a returning "old" player, came back staight to the second position. We checked our records, and it seems he's our longest still-active player! Robokami reaches third place, and proves that Gangs of Space can be mastered to the highest levels even by a new player. At fourth position, the leader of HowlingDragons Ernislav leads the group of 6 players that fought vaillantly and came pretty close to the podium. With barely 10,000 points between the #5 and #10, the competition was really intense! On the Gang side, the fearsome HowlingDragons earn their first place after a very intense battle against their rivals. Even though they didn't place any player in the player top 3, they showed that for the Gang ladder, it's actually teamwork that prevails. Congratulations to them! Thanks to the good individual performance of their members Tigibon and Robokami, Les Cochons Volants reach a very close second place. Mark their name, we will probably see them again in future Galaxies! In third position, Supremacy Inc are pulled by the performance of their most active member Roix. Then, the thanatonautes managed to place two members in the individual top, but it wasn't enough to close the gap with the other 3 "big" Gangs and reach the podium. They stop at a very honorable fourth position, along with 5 other valliant Gangs. We have been a bit caught by surprise by the sudden acceleration of the conquest after a few days, so we have decided to leave this Galaxy open until Monday, June 26. For now, the game will continue to be playable normally, and the ladders will continue to update, but no further rewards will be given to top players & Gangs for this session. We have given the skin rewards to individual players in the top 10, and to all members in top 10 Gangs. Send us pictures of your most beautiful ships in their new shiny paintings! Title rewards will be coming at the end of the session. YOUR FEEDBACK IS PRECIOUS TO US! We've received a ton of very useful feedback from you. Keep it coming! We need to make the next version the best one ever, to storm the world with our Steam release! Thank you all for your participation! It has been great to see you enjoying the game these past few days, and it seems we are on the right track!